There have been 55 anti-Semitic attacks in France since the start of the Gaza War on December 27th. France, home to Europe’s biggest Muslim and Jewish communities, has been hit by 55 anti-Semitic attacks since the start of Israel’s Gaza offensive, a Jewish student group said. PARIS – President Nicolas Sarkozy has appealed for calm and warned that perpetrators of hate violence will be severely punished if they try to “transpose” the Arab-Israeli conflict to France. Raphael Haddad, president of the Jewish Students Union of France, said late Monday that his group had registered 55 anti-Semitic attacks since the start of the Israeli military offensive on December 27. Haddad said the violence was more intense than in 2001 when France was rocked by the spillover from the second Palestinian intifada that was crushed by the Israeli army. Three synagogues have been targeted in a week and there have been huge pro-Palestinian protests in cities across France. 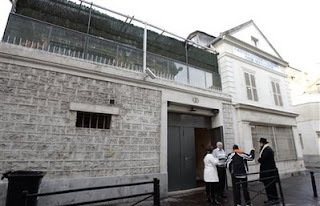 In the latest attack, vandals late Sunday hurled nine firebombs at a synagogue north of Paris in Saint-Denis, setting fire to the next-door kosher restaurant.